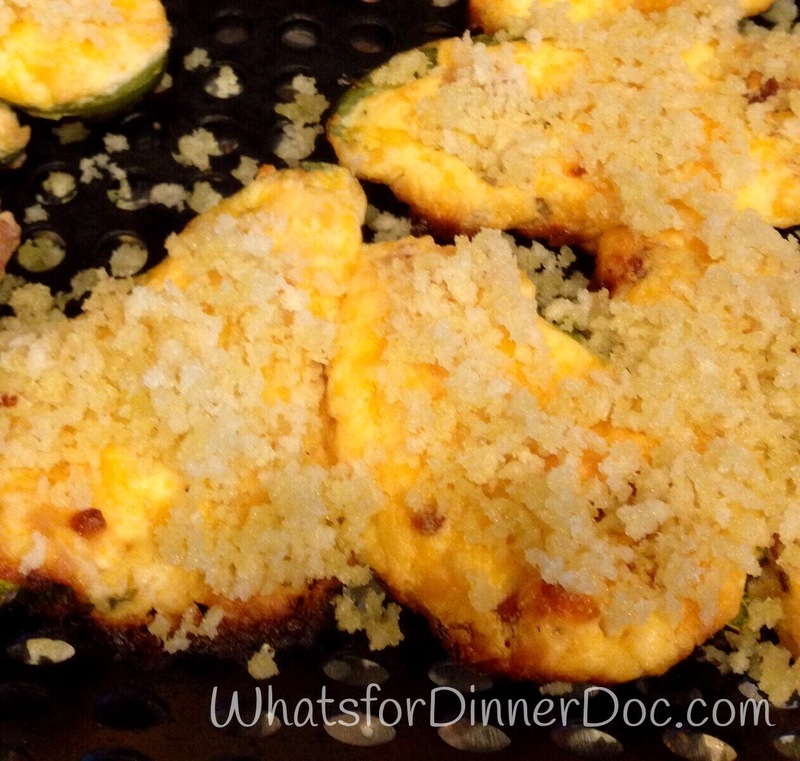 Crispy Panko Jalapeño Peppers – What's for dinner, Doc? We rarely eat American bar food when we are in the States but who doesn’t love a deep fried jalapeño popper? Sometimes a greasy appetizer and a cold beer just hit the spot. 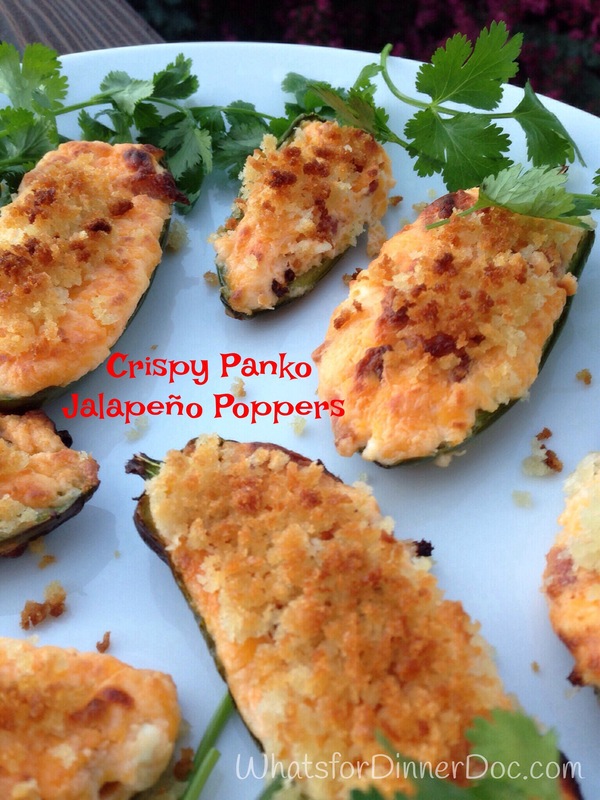 This is a BBQ version of poppers made crispy with a Panko topping instead of deep frying. These are not picante if you remove the seeds and ribs. Leave some ribs if you like it hot! The recipe showcases the ubiquitous jalapeño peppers and cheeses of Mexico. There are limited varieties of cheeses available in rural Mexico so I have learned to work with the substitutions and the results can be delicious. I do worry a little about buying raw goat milk cheeses from the open air market where I buy all of my produce. There is always a chance of bacterial contamination when consuming unpasteurized dairy products. As a precaution, if you are pregnant, I would advice against eating local raw milk cheeses. The freshest cheeses can be purchased directly from the local goat ranchers and you can see the adorable baby goats while you’re visiting. I’m taking my appetizer to Fiesta Friday. • 8 oz quéso crema (cream cheese), let soften on the counter for 15 minutes. Variations: Mix in 1/4 cup green onions chopped or chopped cilantro or minced sweet red pepper. Substitute chorizo for the bacon or leave out the meat for a vegetarian appetizer. If Panko is not available substitute dried bread crumbs. 1. Wash and slice peppers. Use gloves to keep your hands from burning. Leave 1/2 of the stem attached to each piece. Remove seeds and ribs. 2. Mix remaining ingredients with a fork until combined. 3. Fill each half pepper with a heaping spoonful of cheese mixture. Mix panko and olive oil and top each pepper with a scant tablespoon of the mixture. 4. Grill in the barbecue on medium heat until peppers are soft, slightly blackened and the Panko is crisp. If your barbecue has a broiler element then you can quickly broil the peppers for a more crispy topping. Watch closely and don’t burn them. If Tom eats them all he’ll get fat. Here’s my solution. How about you make me a whole bushel of these and send them to me weekly???? These would be a huge hit in my house! Boys do seem to go nuts for crispy, cheesy treats. At least they aren’t deep fried. I’ve made these with low fat cheeses and sun dried tomatoes with good success for a healthier version. Now I’m thinking about a vegan option, maybe made with cashew cheese or mushroom paste. I love “conversing” with you because I’m always inspired to see how I might adapt a recipe for your eating style. Thanks for the inspiration amiga. Pingback: Ten Essential Kitchen Gadgets You Can’t Live Without in Mexico – What's for dinner, Doc?